Reading and share top 12 famous quotes and sayings about How Time Flies by famous authors and people. Browse top 12 famous quotes and sayings about How Time Flies by most favorite authors. 1. "How are you doing, my love? Things are pretty good on this end of campus. I had a great time with you last night at the baseball game. I never would have guessed you were such an avid sports fan! You can holler with the best of them. 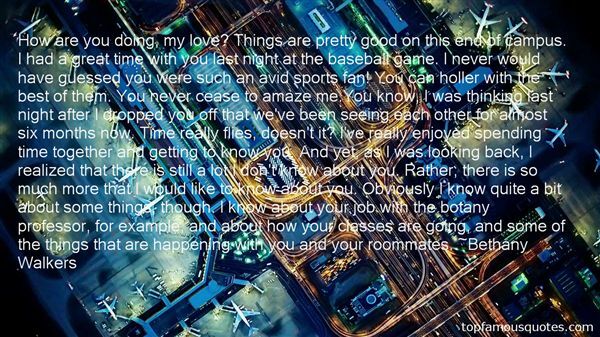 You never cease to amaze me.You know, I was thinking last night after I dropped you off that we've been seeing each other for almost six months now. Time really flies, doesn't it? I've really enjoyed spending time together and getting to know you. And yet, as I was looking back, I realized that there is still a lot I don't know about you. Rather, there is so much more that I would like to know about you. Obviously I know quite a bit about some things, though. I know about your job with the botany professor, for example, and about how your classes are going, and some of the things that are happening with you and your roommates." 2. "Notice how we are perpetually surprised at Time. ('How time flies! Fancy John being grown-up and married! I can hardly believe it!') In heavens name, why? Unless, indeed, there is something in us which is not temporal." 3. "The tiny space, the toilet, two hundred strangers just a few inches away, it's so exciting, the lack of room to maneuver, it helps if you're double-jointed. Use your imagination. Some creativity and a few simple stretching exercises and you can be knock, knock, knockin' on heaven's door. You'll be amazed how time flies." 4. "I have read that long ago there was a land of glass castles that sank beneath the sea. It was not called Atlantis, but Lyonesse. This happened before history and across the ocean, but when I was little I wondered about that place, how it could be so beautiful and so lost. Sometimes it seemed that the land around my New England home was like that flooded country, with mud where the streets of gold should be and mayflies swarming where there should be lovely fishes, but here and there a shard of crystal to call the heart to beauty. --"Wetlands," in Phoebe." 5. "- and how time flies! What, has it already been twenty years, already forty years that we are together? Why, how terrible! We haven't yet said all we wanted to say to each other... May we have a little respite, or else may we be allowed to begin all over again!" 6. "[The kakapo] is an extremely fat bird. A good-sized adult will weigh about six or seven pounds, and its wings are just about good for waggling a bit if it thinks it's about to trip over something — but flying is out of the question. Sadly, however, it seems that not only has the kakapo forgotten how to fly, but it has forgotten that it has forgotten how to fly. Apparently a seriously worried kakapo will sometimes run up a tree and jump out of it, whereupon it flies like a brick and lands in a graceless heap on the ground." 7. "Life passes like a flash of lightningWhose blaze barely lasts long enough to see.While the earth and sky stand still forever,How swiftly changing time flies across man's face.O you who sit over your full cup and do not drink,Tell me -- for whom are you still waiting?" 8. "Doesn't it scare you sometimes how time flies and nothing changes?" 9. "Ever have one of "those" days?? Me too. Everything seems to go any way but your way -- again, me too. As I was unwinding a cord today, it reminded me of how our lives can be --- tangled and messy. And when we get in too big of a hurry, it just becomes more tangled. What a mess it can become! When was the last time you sat down with God, reading His Word, going over His plan for your life?? When was the last time you took time to enjoy God's creation -- sitting outside listening to the birds, watching the butterflies, smelling the flowers, etc?? When was the last time you just spent time with your family or other loved ones -- not because it was a family function, but just because you wanted to?? Sometimes the best way to untangle and clean up the messiness, is to just SLOW DOWN ... take a BREAK and remember to ENJOY the little things in LIFE." 10. "It's funny, don't you think, how time seems to do a lot of things? It flies, it tells, and worst of all, it runs out." 11. "From sunrise to sunset, from one day to the next, till our black hair turns white, we eat, we sleep, we bear children and we watch them grow. We watch them get married and in turn bear children of their own. How time flies, we say to ourselves. 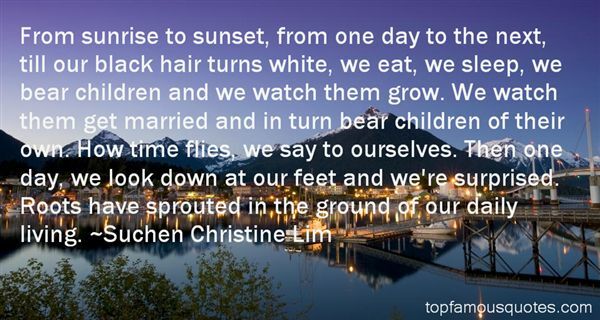 Then one day, we look down at our feet and we're surprised. Roots have sprouted in the ground of our daily living." 12. 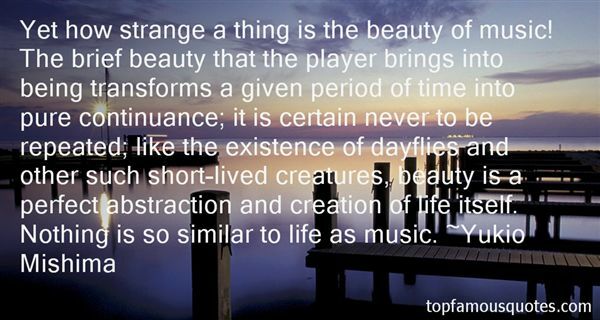 "Yet how strange a thing is the beauty of music! The brief beauty that the player brings into being transforms a given period of time into pure continuance; it is certain never to be repeated; like the existence of dayflies and other such short-lived creatures, beauty is a perfect abstraction and creation of life itself. Nothing is so similar to life as music." As long as the plots keep arriving from outer space, I'll go on with my virgins."